Home to some of the only bouldering in Ohio. Great day trip if it's close by with some definite classics. 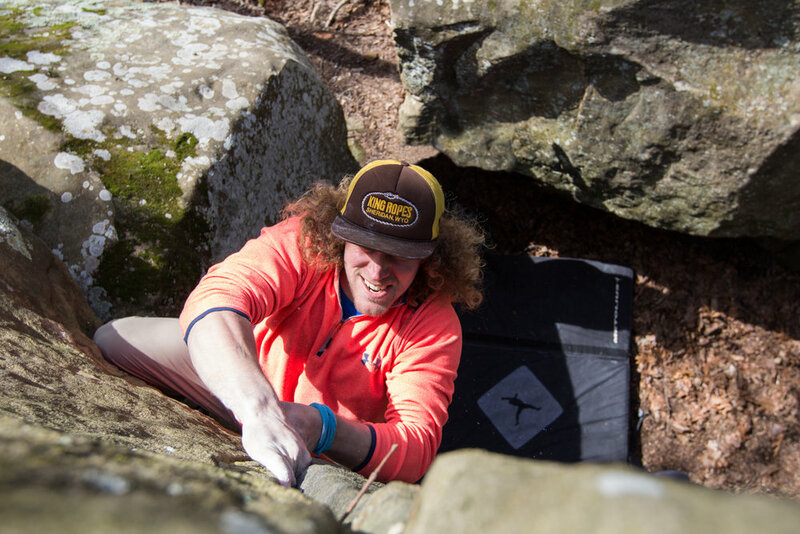 Witches Front/Back and Trailer Park are the two more boulder dense areas with difficulty ranging from V0 to V7. The best season is fall, but any time that there has been a dry spell of at least 2 days will work. Very little of the climbing is rainproof and all of the rock is weak and easily damaged when wet. Athens is accessible from Route 32, 33, 50 and 56. Most of the climbing is off of Route 33/50 or E. State Street. There currently is no guidebook for this area, but you can view routes on Mountain Project or on Bouldering Athens County. Call 740-594-2628 for more information. Happy Hills Campground and Cabins is a beautiful campground in the Hocking Hills featuring a private fishing lake, swimming pool, game room, playground, Modern spotless bath house, a laundry facility and a camp store. Happy Hills is conveniently located to the State Park attractions, as well as great shopping, antique malls, craft specialty shops, golf, ATV and bike trails, and restaurants.